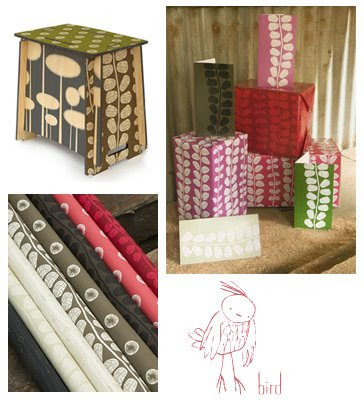 The gorgeous eco-friendly textiles of Bird textiles are instantly recognisable. The brainchild of Rachel Bending, the colours and design of Bird textiles are inspired by the elements of beautiful Byron Bay. The label has a strong cult following, and Bird texiles now grace products from fashion to home furnishing to stationery. Rachel's philosophy is passionately about sustainability in design and the Bird studio in Byron Bay is a temple of social harmony and environmental responsibility. The botanical designs are hand-drawn, printed using water-based dyes and handmade into delightful products using solar power. One of my favourite products in the collection is the collaborative Zaishu featuring Bird designs on the iconic stool/table. You can find Bird Textiles at HQ store and studio in Byron Bay, the Emporium in Surry Hills, Sydney, online at the Bird Textile online store and at stockists around Australia (check the website for details). PS: Look! The Bird logo incorporates a darling bird illustrated by another favourite, Emma Magenta. I LOVE Bird products. Their shop in Surry Hills is fantastic. It's in an old chemist shop, complete with the original timber fit-out. Hi all, thanks for your comments. Can't wait to see you in the bandanna Bec! And Lisa thanks for the description on the Emporium. I'll definitely have to stop by the next time I'm in Sydney. Very lovely, fresh designs. And appreciate the social responsibility side as well. You have a great blog here. I've just signed up as a follower! Thanks so much artygirl; so glad that you like Bird too.